Torn was inspired partly by the tragic marriage of a close friend coming to an end and a strong artistic need for getting back to basics, The Blues. In a sense it is a concept album. The 9 songs follow each other in a logical order telling the story of a relationship falling apart. ''Come on in My Kitchen'' representing the initial attraction and the ''Thrill is Gone'' the end of love. The sound of the album is exemplary with dynamics of an addictive quality......the drums are practically visual and one feels as if one could reach out and and actually touch the singer. Gomes Sings "You better come on into my kitchen, 'cause it's going to be raining outdoors" and what a wondrous musical kitchen she possesses. The utensils are the thoughtfully played musical notes. The chef is Carmen herself, serving a dream-like melodic delicacy. We at Adore Jazz, play the music from Gomes' new CD "Torn" with great joy. Gomes has a bluesy voice, that balances gracefully between sensual surrender and control. When she sings the blues, she sounds as if plucked from the cotton fields. In a gospel-typed tune, one has to restrain oneself from shouting hallelujah. ...The most important thing is that she's got the blues. I don't mean she sings blues-songs - which also happens occasionally - but more importantly, in her phrasing you can hear everything that the blues stands for. That is quite an achievement. Pure and accesible jazz with a bluesy feel, that makes you tingle. 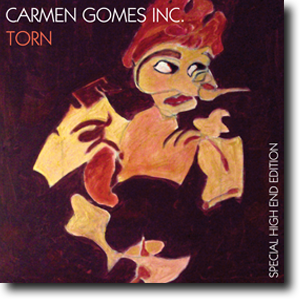 Torn is the 9th Studio album from Carmen Gomes and her first for the Sound Liaison label. The album was recorded in 2 days in studio 11 of the Dutch World Broadcasting Service. The music was recorded live, with the all musicians in the same room, but with a higher degree of separation between the instruments than the Studio Showcase albums, thus making small repairs and overdubs possible. Recorded at Studio Eleven (Hilversum) on April 15 &16, 2012. This recording is specially made by Sound Liaison for and with lovers of high-end audio recordings. Special for those who own high-end audio equipment will have maximum benefit. What made this record different is that the file is a one to one copy of the master file (96kHz/24bit).